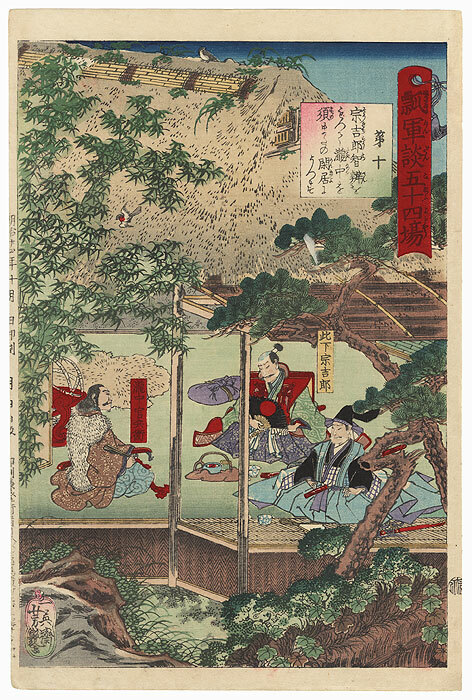 Yoshitsuya's Fifty-four Battles of Hisago - Around 1864, Yoshitsuya created an incredible series of prints based on the legendary exploits of general Toyotomi Hideyoshi and his brave retainers. 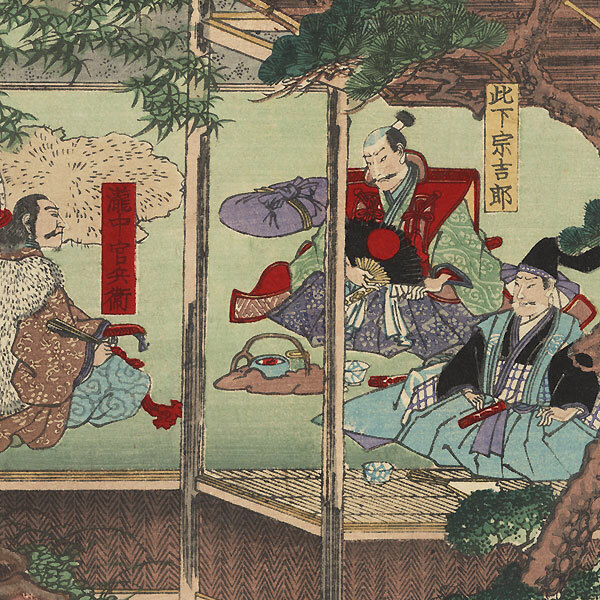 Hideyoshi's army was nicknamed "Hisago" (gourds) after the general's gourd crest, hence the title of the series. As a young samurai, Hideyoshi went by the name of Konoshita Sokichiro, so episodes earlier in his life refer to him by this name. He later joined the Oda clan, eventually becoming Japan's second great "unifier" following the death of Oda Nobunaga. To evade censorship, the name Mashiba Hisayoshi stands in for Hideyoshi, and Oda Harunaga represents Oda Nobunaga. With vibrant color, wonderful attention to detail, and masterful compositions, these images are brimming with energy and action. This print is from a Meiji era edition published in 1891. A great choice for a samurai enthusiast. Condition - This print with good color and excellent detail as shown. 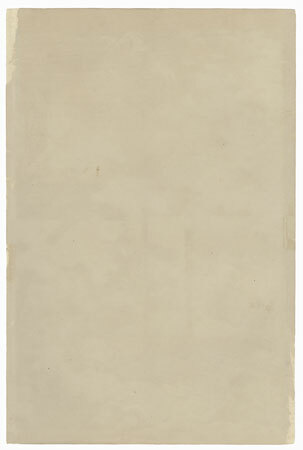 Paper remnants and slight thinning on reverse at sides from previous mounting. Slight soiling, a few spots and creases. Please see photos for details. Good overall.